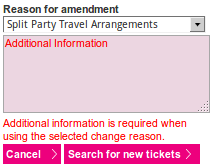 Under what conditions can I split a party when amending an Advance railway ticket with a Two Together Railcard, and what information would I need to provide in the free text field for Additional information? Prior to me asking this question, there is exactly one Google result for “split party travel arrangements”, and it does not contain helpful information. In case it matters, I booked my tickets from First TransPennine Express. Whilst there are no refunds on Advance tickets in most cases you can change your journey prior to travel (up to departure) for a £10 fee plus any difference in the fare payable. However, please note that if you choose (where offered) to print your tickets at home or download them to your mobile device, different rules apply and you may not be able to subsequently change your ticket. The relevant conditions will be made clear when buying your ticket. While I know for a fact that such amendments can include changing in origin, destination, and which train; I don't know if they include removing a railcard discount. I would just explain the circumstance in the "Additional Information" box (that you are no longer able to travel together) and request to have the railcard discount removed from one ticket, and the other refunded, if possible. If they don't allow this, then your best bet to remain valid would be paying full price for both tickets. What is unnecessary additional information on visa application?